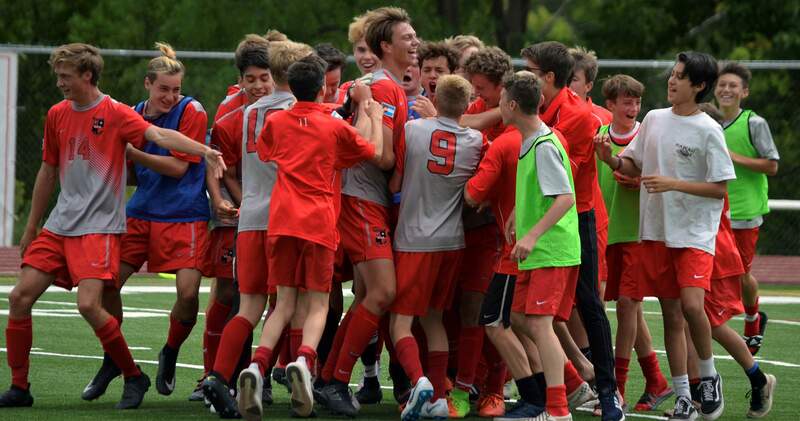 The Durango Demons swarmed Logan Fullington after he scored a game-winning goal off a corner kick with 45 seconds remaining in double overtime Saturday at home against Battle Mountain. Leland Heinicke scored two goals for the second time in as many days, and Logan Fullington provided a thrilling overtime goal to send the Durango Demons to a 3-2 win Saturday against Battle Mountain (1-1). The two teams played into the final minute of double overtime. With 45 seconds remaining in the second overtime, Fullington scored off a corner kick to give the Demons (2-0) a win. Durango trailed 2-1 at halftime, but the Demons tied the game in the second half to force overtime. Heinicke’s equalizer also came off a corner kick with 6:45 to play in regulation. Durango’s next match is also at home against Farmington. The game is scheduled for 5 p.m. Tuesday. Crested Butte 8, Bayfield 0The Wolverines were on the wrong end of a lopsided season opener Saturday in Bayfield. Josias Navarette scored 12 minutes into the match to give Crested Butte an early lead, and it would stand as the winning goal in an 8-0 Bayfield loss. Carlos Franco added a penalty kick goal for Crested Butte to give the team a 3-0 lead at halftime. He scored again in the second half and also had an assist. Bayfield had one shot on goal. Bailee Blakeslee was in goal for the Wolverines and made nine saves. Caleb Lake also played in goal the final 10 minutes and made one save and allowed one goal. The Wolverines will host Telluride at 4 p.m. Tuesday. VolleyballDurango showed skill and poise in its first volleyball match of the season Saturday. The Demons beat Pagosa 3-0 (25-23, 26-24, 25-21) in Pagosa Springs. “We played really well as a team for our first game, and I’m very proud of the way we fought back in Game 2 to win being down eight,” head coach Colleen Vogt said. Durango’s home opener is at 6 p.m. Tuesday against Farmington. Ignacio High SchoolThe Bobcats opened the volleyball season with a road split Saturday. Ignacio (1-1) beat Monte Vista (0-2) in five thrilling games after it won the final three. Ignacio was behind after losses of 17-25 and 20-25 but rallied to win the next three 25-23, 27-25 and 15-10. In the second game of the day, Ignacio was swept by Del Norte (2-0), 25-18, 25-11, 25-7. Ignacio will play at home at 6 p.m. Thursday against Ridgway. SoftballAfter two tough losses to open the season last week, the Durango Demons picked up four big wins Friday and Saturday on the Front Range. Durango had wins of 22-3 and 21-3 on Friday against Hinkley in Aurora. The team then swept two games from Sierra on Saturday. Scores from Sierra were not available, though Durango outscored its opponents by a combined 90-10 during the weekend.